Kate Shackleton is called to help locate a missing stone mason. His wife Mary Jane Armstrong is adamant that Kate can help her, and in the face of such belief Kate agrees to accompany the woman back to her home in Great Applewick. The story Kate pieces together is, that Mary Jane’s children Harriet and Austin had gone to the quarry where their father worked to bring him lunch, and that the daughter Harriet had found him dead. Walking to the next farm for help, when she returned with the farmer, there was no one to be found, neither her father, nor a body. As Kate investigates she encounters hostility from the quarry foreman, and discovers that Ethan Armstrong had active strong political views. The more she investigates the more it becomes apparent that there could be more than one reason for the absence of Ethan Armstrong, or his body. But for Kate this is more than the mystery of a missing man, for she becomes embroiled in a family situation – her family, or rather the family that she was unaware existed, but nevertheless her family, raises for her many questions. A good mystery that had me perplexed, but also a moving episode in the life of Kate Shackleton who still believes that even though the war has been over a couple of years that she may still find her husband, posted missing presumed dead, but maybe just with a missing memory – it happens why not to Kate. Frances Brody is a pseudonym of Frances McNeil who lives in Leeds where she was born and grew up. She worked in the USA as a secretary in Washington DC and New York. Frances studied at Ruskin College, Oxford and read English Literature and History at York University. Starting her writing life in radio, she has written scripts for television and theatre. 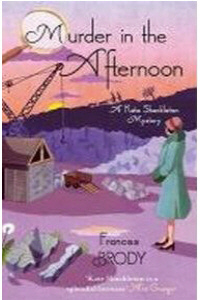 Frances turned to crime for her first novel, Dying in the Wool, set on the outskirts of Bradford, Yorkshire in the 1920s, was followed in 2010 with A Medal for Murder.